The product line FIRST offers control panels for elevators, combining functional clarity and attractive design with real strength and reliability. 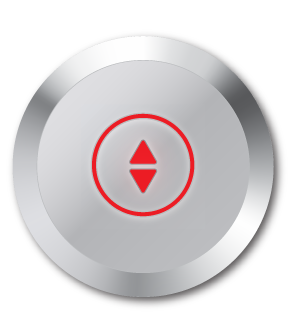 In addition to the buttons for marking the respective stops, that are illuminated when pressed, the button panels we install have an overload light signal, GSM communicator and emergency lighting. In the cabins of our passenger elevators we integrate simple and cost-effective cabin button panels type Slim or beautiful and efficient button panels type Columnar with the height of the cabin, made of high-grade Inox Satin stainless steel. For platform type freight elevators, where the freight is not forced by an individual, the call may be remote and a cabin button is not required. The layout is simple and functional, consistent with state-of-the-art technology and design solutions – a round button in a nice Inox Satine stainless steel panel. Combined with displays that can show the location, direction of movement when the cabin has stopped, as well as the direction of movement by running arrows, they complement the architectural style nicely and highlight the specifics of the interior of each building.